Oil Lift Storm Force Bow to Stern Boat Wash is a marine grade high concentration cleaner specifically designed for washing all interior and exterior aspects of boats: wood and fibreglass hulls, decks, ropes, cleats, fenders, bilges and many other applications. Our highly effective non-toxic formula improves cleanliness in multiple marine applications while its concentrated format/dilution reduces overall cleaning costs and it is environmentally safe and friendly. Use Storm Force Bow to Stern Boat Wash to clean and restore your boat's natural beauty. Cleans interior and external contaminates on boats. Multi-purpose marine applications including hulls, decks and fenders. Twice rated #1 marine cleaner by Pacific Yachting Magazine. 948 ml. Industrial Strength, Non-Toxic, Bow To Stern Boat Wash Oil Lift Storm Force Bow to Stern Boat Wash is a marine grade high concentration cleaner specifically designed for washing all interior and exterior aspects of boats: wood and fibreglass hulls, decks, ropes, cleats, fenders, bilges and many other applications. Our highly effective non-toxic formula improves cleanliness in multiple marine applications while its concentrated format/dilution reduces overall cleaning costs and it is environmentally safe and friendly. 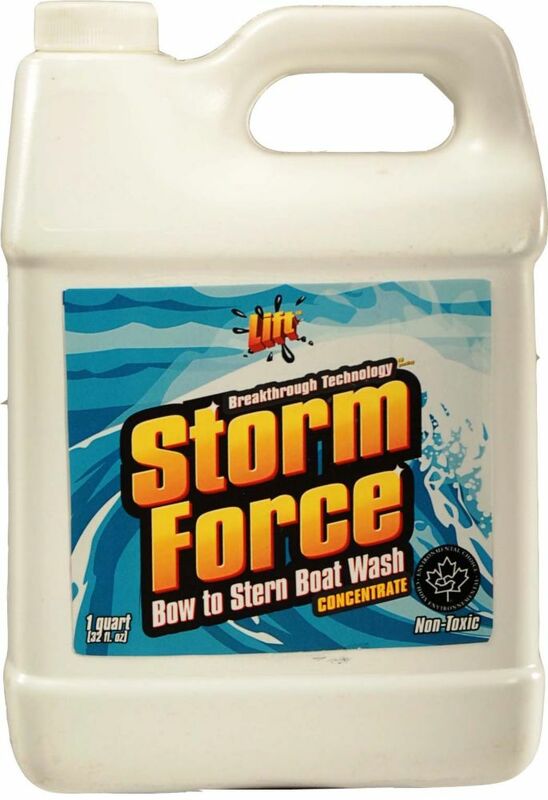 Use Storm Force Bow to Stern Boat Wash to clean and restore your boat's natural beauty.